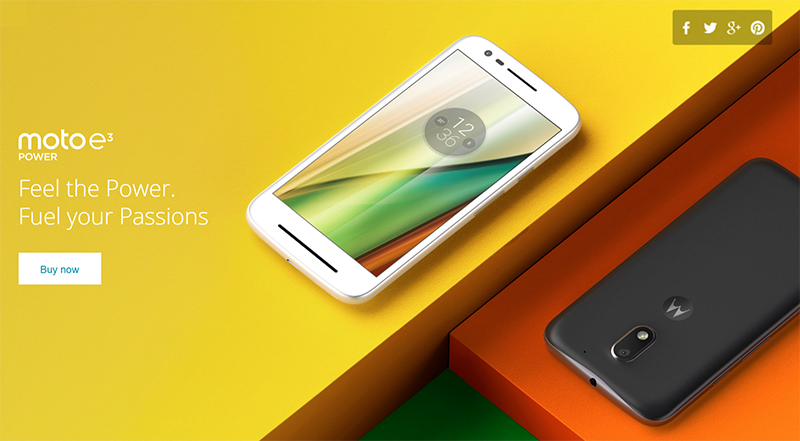 In India, Lenovo's Motorola group has announced a new handset, the Moto E3 Power. It's a budget handset with capable specs and large battery capacity for its class. Related: Moto E3 Power With VoLTE Goes Official In The Philippines, Retails For PHP 6999! The Moto E3 Power features a moderately sized 5 inch screen with HD resolution of 1280 x 720 pixels. Under the hood, it is powered with a 64 Bit MT6735P quad core chip with a 1.0 GHz clock speed. It also has Mali T720 GPU, 2 GB of RAM for casual multitasking, and 16 GB of expandable to 32 GB storage. The highlight of this smartphone is its large 3,500 mAh battery. Given that it only has a supposedly low powered 5 inch HD screen and lower clocked CPU, this handset might have an up to two days of battery life. The other specs of the phone includes an 8 MP main camera w/ AF and LED flash, 5 MP selfie shooter, LTE connectivity, and Android 6.0 Marshmallow OS. In India, the device retails for Rs. 7,999 which is at USD 120 (Around 5.7K Pesos) out of straight conversion. There's no word yet if it'll reach the international market including the Philippines. We'll keep you guys up to date!